I couldn’t help but notice the flying shoes. Strewn across power lines all over El Salvador was pair after pair of dirty, old tennis shoes that had been tied together and strung over the wires that lined the streets. On the bus, our guide pointed them out – telling the story that those tennis shoes serve as territory markers for the violent gangs and drug cartels. As we got off the bus in each area, the guide gave specific instructions about what we could eat and drink, the time we had for the stop, the dangers of the area and the challenges the locals were facing. I was grateful for his direction and knowledge. It helped me know what to do and how to respond. Made me feel more confident. More safe. With the guide, the trip was far better than it would’ve been had we tried to explore the region on our own. 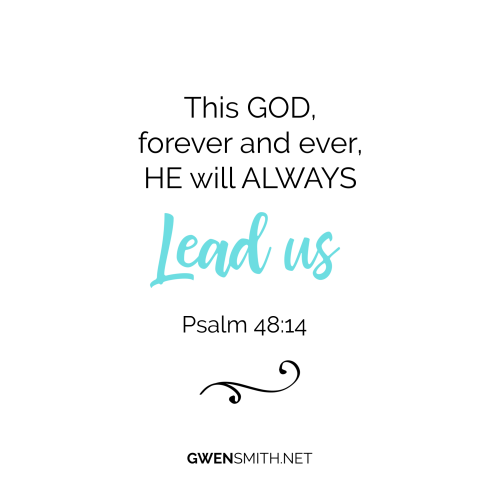 Psalm 48 celebrates God’s presence and showcases Him as our Security, Defender and Guide. A good guide knows his stuff. He’s got the backstory on places you go and is able to answer the questions that come up along the journey. A good guide stays with you, even in the scary places, and helps you see and understand the history, significance and culture as you pass through new places. A good guide welcomes your questions, warns you of danger and points out tennis shoes on power lines. As I read Psalm 48:14, I breathe in a fresh confidence. God is not just a good guide, but the one and only perfect Guide. He’s the Guide I need. The Guide that walks with me along the path, offering protection and direction. Our security and peace are amplified when we listen to and heed God’s instructions. In Your presence I find joy and security. Thanks for being my Defender and Guide. Thank You for offering me access to Your endless protection and direction. Please help me know what to do with ____________________. 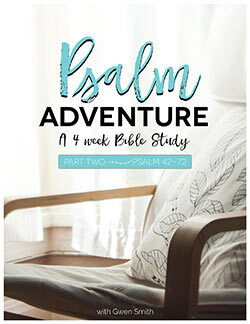 What two requests does the psalmist make? What’s the chosen response? Will you make the same request and response today? What do you need to trust Him with? Tell me about it – or leave a prayer of response on the wall of my blog. Dealing with any difficult people or complicated relationships? 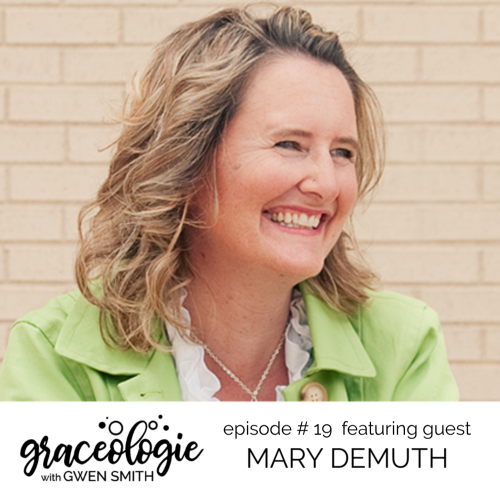 On episode #19 of the Graceologie Podcast, my guest is MARY DEMUTH and we talk about her book THE SEVEN DEADLY FRIENDSHIPS. 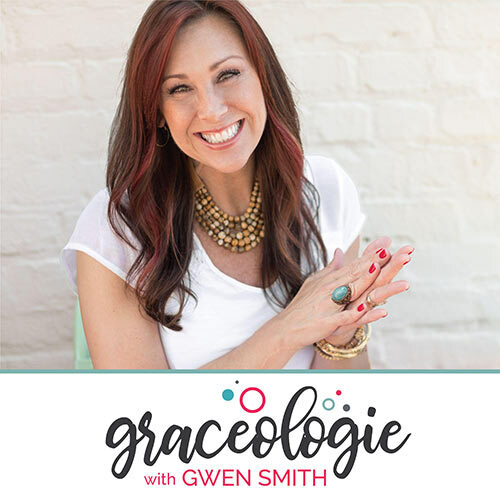 This conversations is powerful and will equip you to move forward in healing, relational health, and hope. I really really needed this today!! For a very time I had let my relationship with God slide and only because he knew the reasons he was definitely holding me in the palm of his hands. Last year I went through a very scary experience…I was hospitalized for almost 11 days, several in a medically induced coma because of nearly dying from MRSA pneumonia and then in September my father, best friend went home to heaven. Finally after all this slowly getting back to a daily prayer and devotion time most of the time in the early morning! One area that I struggle with is trusting God with my husband of 35 years and 5 grown children…but he reminds me when I have anxious thoughts that He’s got this and to praise him in the storms!! 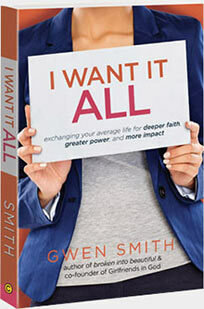 Thank you Gwen for your dedication to women! God bless you ladies!! Let us lean on Your wisdom and guidance above all else! We need You to be our Heavenly Counselor-as we are desperate for Your leadership as our Shepherd. We Your sheep, who You bought with the ultimate price tag on the cross at Calvary’s hill, bow down our heads and humble ourselves to follow You! Let us release our selfish plans into Your hands and fully submit, surrender and commit to Your purpose! Thank God for your ministry, I pray for continued blessings upon you. Dear Heavenly Father God Jehovah, thank you for your unfailing love, favor, grace, and tender mercies upon us all. Thank you for all your blessings. On this day as I seek you for answers I pray and ask others to gather with me in prayer for peace with my daughter, Lord I try so hard but Lord it’s not up to me, I ask you to step in and fix these issues according to your Holy will and grant me authority over my granddaughter until her mom can focus and begin living a wholesome life. Father I pray that she seems you and find you and I thank for allowing me to seek you for my life and I thank you for ministries such as this one to help in my journey. Thank you Lord as I pray I expect and look forward to your will for the lives of us all. I pray for you to fill my heart, mind, body and soul with Your Holy Spirit. Deliver me from my feelings of stress, not good enough, sadness. Lift me up to do your will. I trust Him with all of me , and everything , I don’t leave home until I seek Him for He can guide me and protect me. We need to find a smaller place to live for less money- not a given in HK. Yet, I know God will guide us to such a place. I have had some stong tests of my faith when I have seen devoted Christians be killed in tragic accidents. This has tested my strong faith in the past that I am under his protection. Now I know that he will protect me unless he allows it and I am having a hard time being at peace with that. Yes, I know that If God permits it, God has purpose in it and will work it our for my good, for I love God and know that I am called according to His purposes. But that doesn’t necessarily give me peace; its as if I’m waiting for the other shoe to drop. I really related to you post. I, too, have lost some loved one to horrible reasons. One of the losses tested my faith in an extreme manner. I love God too. I know He works all things for good and protects me. However, I am having some trouble being at peace with not understanding. Thank you for sharing. I have tried over and over again to trust God in church. I know that sounds really dumb.I have not been in church in months. I don’t feel safe with all the shootings going on. Every time I went to church (over the last 2 years) I would get inside and have a major panic attack and have to leave. I have prayed and prayed about this and it hasn’t worked. I have also tried medications which have had horrible side effects. I did spend some time with one of the deacons wives talking to her about it. Didn’t help. It makes me sad that I can’t do this. I have also read several christian books on fear, again hasn’t helped. I have given up. I am entrusting my relationships (or lack thereof) with my daughter and her family (my grandchildren and my son-in-law) and with my siblings, especially my 3 younger sisters. I’m praying for wisdom and patience to wait on God and to take my hands off and set good boundaries to protect my heart right now. Please pray I can trust God with my health stuff that affects me dialy and for deliverance from my anxiety.. So thankful and blessed to know God is always with me during scary times. I have anxiety and loneliness as I try to take care of myself each day. But by the grace of God he provides for me to make it. Having a dread disease has it’s difficult moments. Glory Glory to God. Please pray for my sister-in-law who lost her older sister. May her memory be eternal. Thank you Jesus for all you do for me. You make all things possible. Amen. Hi I also stuffer from anxiety, insomnia and boats of depression. I need prayer for this and also finances and a marriage that’s not going well at all. I also have a grandson who has been living with us for 2 years now. He now wants to return to his mom but the situation is less then ideal. He has come from an abusive dis functional family. We’re concerned that this isn’t a good choice to go back. Praying that God’s will, will be done in this situation. May our Heavenly Father meet all the needs of those who wrote their prayer requests here. Please pray for my friend Vicki. She is going for a biopsy today for a mass on her left lung. May she feel amp know the Lords comfort and peace. Please pray for me. I have terrible insomnia and anxiety. I have been asking God to direct me to the person who can help me. I can’t function at all. Please pray for me. A few days ago I learned my sister in law has Corticobasalen Degeneration and I am taking this very hard for so many reasons. She lives in Germany and I am in North Carolina and feel helpless. I can not imagine the pain and suffering she is going through and they have given this rare disease, which has no cure, a shelf life of 7 years. She is 59 and has a brand new grandson. My brother has quit his job to care for her. This is so hard on all of them and my heart breaks for each one of them. Please send prayers of comfort to Beate, David, and Jessica. Ask God to show all of us the way to go and his will be done. Thank you and God Bless all of you. I need to trust in God during this time of transition. Selling our home, moving to a new state, finding a new home and most importantly, a new church home. I need not panic, but pray. God is taking me out of my comfort zone, my routine and setting me on an adventure. 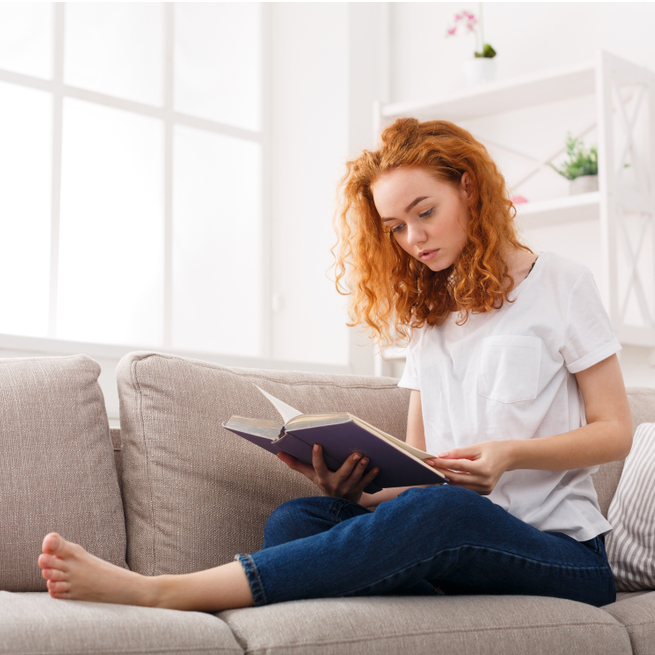 Good morning, after reading Especially In Scary Places, I came to your blog to leave a prayer request After reading the prayer requests of others it brought tears to my eyes. It reminded me to count my blessings and that I am not alone in the struggles of this life. I lost my job in October, 2018. It is a very scary time. I have been in this place before and the LORD has seen me through when I thought I would just fail. My testimony is just amazing of His Grace! So this time I am trusting Him fully to lead me through it again. BUT, it is still scary and I’m asking for prayer that I will find a job or, if it’s His Will start my own business. I lift those who have needs today in prayer that His Will be done. Thank you for your prayers. Great deviation and what I needed this exact time !! !please pray for family Chritisn health center . A clinic that meets the needs of the underserved . I know God has us but that are challenges !!! My husband and I have both left our jobs to devote ourselves full-time to the real estate group we started two years ago. We are praying fervently for guidance on growing our business to sustain us and our family as we know this is the dream God put in our hearts. I need to trust him with our finances. My 34 year old son who struggles with anxiety and depression is about to suffer the loss of his dog. The dog has cancer. The end is near. My son has lived alone with this dog for 12 years. It is going to devastate him. Please pray for strength and that he would not do anything to harm himself. I pray God will use this to heal the relationship between he and his dad. Thank you. Good morning 🌞🌞. As I read your devotional this morning I gather some strength. I am struggling with the need for a home for some time now and I’ve prayed about it. I’m in dire need, I have the land, I just need help with building materials. Please help me to pray, I am weary and weak from bouncing around.